Well it’s been a pretty quiet month at the Flying Bike Cooperative Brewery, smack dab in the heart of the Greenwood Central Brewing District, right next door to Naked City, not far from Lantern and Bluebird, and just a good brisk walk’s distance from those newfangled Ballard breweries, trying so desperately to catch up. You should go visit them, too, just to be nice. Don’t you love it when we can slide our big doors up and let in the light and air? ‘Tis the season. So we brewed our new Loral Pale Lager, fermented with a classic, clean Swiss lager yeast, and featuring the modest but discernible presence of a nice new domestically grown hop called Loral, which combines Old World “noble” and more assertive New World flavors, for a summer refresher that isn’t boring. Also, it’ll keep getting better, as such a lager beer does. As is often the case, the last pint will probably be the best. So keep going back. English Session Ale competition winner John McCaslin will be coming in to brew his masterpiece, and that’ll be on draft before the month’s out. I don’t know about you, but I believe I will be having more than one. That’s a special English ale yeast, and since that’ll be up and running, Agustin (Sanchez) and Jesse (Young), your assistant brewers, and I have been plotting a little. How about we brew Sarah Rood’s milk stout with that yeast, which is especially suited for such things, and put some in whiskey barrels for a while, and see what happens? OK then, we’ll see what happens. Speaking of going too far, all these hazy New Englandy things we’ve been brewing and enjoying have inspired us to attempt what we’re thinking of as an “imperial hazy pale,” an almost 10 percent monster we’re calling “Opinionator,” in honor of its more modest predecessors, the Opiny the Yelper and Second Opinion IPA’s. It’s coming along nicely, and by mid-June you’ll be able to sit down for some extended quality time with a snifter. Be careful--it’s perilously drinkable. Don’t be shy--come back and talk to me and Jesse and Agustin when you see us back there working. We like to talk to you about what’s up. OK, maybe sometimes we’re a little busy, but still. It’s all about getting to know each other, making beer, and having fun. Introducing Jesse Young, Flying Bike's new Brewery Assistant! We're tickled pink to have Jesse Young onboard as Flying Bike's newest Brewery Assistant. Jesse has been around for the past few weeks so you might have seen him already, but we thought we'd make some space for you to get to know him as he'll be helping Kevin with many aspects of running our brewhouse and keeping the lights on. Welcome to the family, Jesse! "Hi, my name is Jesse Young, and I'm founding member #929 here at Flying Bike Cooperative. 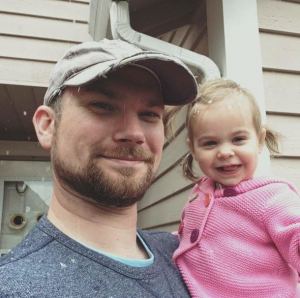 I am a Stay-At-Home-Dad for my 2 year old daughter Clara and husband to my wife Megan. We've been in Seattle for 4 years now, and love living here in the PNW! When I’m not brewing, I love to spend time hiking, biking, and enjoying the outdoors with my family. I've spent a few years in Denver, CO and Columbus, OH, but I'm originally from a small farm on the bluffs of the Mississippi River between Minnesota/Wisconsin. I got into brewing when my wife got me a home brewing kit many years ago and I'm so lucky to have found something that brings all of my passions and creativity together. I typically home brew about 2-3 times a month trying out new ingredients to get that perfect pint. I've had an extensive career in Finance, Corporate Operations, Kitchen Management, and a three year tenure at Micro Homebrew and I majored in Anthropology at Ohio State University. 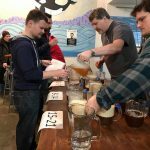 I am also the creator/owner of Abrosis School of Brewing where I teach “Learn to Homebrew” classes. 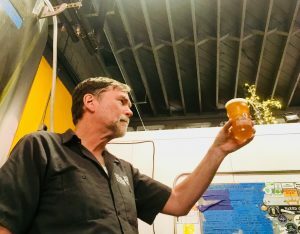 My goal is to spread my enthusiasm of the craft of brewing while educating people on how they can brew the best beer possible and the vast anthropology/history of beer. 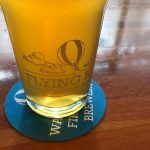 I'm lucky to be part of the team here at Flying Bike, and super excited to see what marvelous brews and ideas Kevin and I can bring to your glass. Cheers and Happy Brewing!"